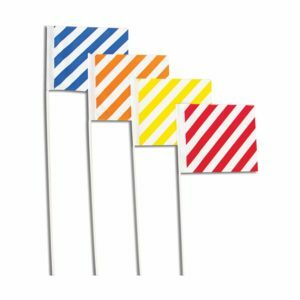 Drive your sales with these full color custom flags. Choose between multiple sizes and high visible colors. Place them in your field to promote your business, name recognition, and increase sales. One-time $20.00 fee for new screens and screen changes. We prefer cdr, eps, ai, and pdf formats. There is an additional $18 set-up charge. Two-sided printing is available. Call 1-800-942-5816 for more information.